Okay, so the latest on the ESPN.com MLB Rumor Central is that the Brewers and Pirates are making the strongest pushes for Suppan, with Suppan’s agent having already received one offer and expecting a second offer soon. There is also talk that the several teams that don’t win the Barry Zito sweepstakes would be interested in Suppan after Zito chooses to sign somewhere. 1. First, the reported salary range for Suppan talk has reached 4 yrs, $40+ million. I don’t think that the Brewers would want to spend that kind of money on a Jeff Suppan. *Note, I didn’t say "on Jeff Suppan" because, honestly, he isn’t a superbly spectacular pitcher. He is a good pitcher, but not an ace. 2. If there are many other teams that are willing to spend the money on Zito (which in this market is probably going to be $13-15 million per), then I think if we don’t get Suppan signed before Zito signs, then we aren’t going to sign him at all. So, what would you all like to see the Crew do on this one? As always, any/all thoughts and comments are appreciated. In an ironic twist, unless something else changes, I’ll have an inordinate amount of free time over the next several weeks to post to my little heart’s content. Look for several new posts from me, ADAM RYGG, over the next stretch of time. I will be back with a venegeance…and at all times of the day, because there isn’t anybody who can do anything about it anymore. I attended Monday night’s game and meant to write this up after the game, but I had a bit of a problem of keeping my eyes open long enough to even listen to the entire WSSP post game show (on which I was a caller, by the by). Anyway, I wanted to share my experience with you all a bit and tell you the things that I noticed live. Things that I haven’t really had a chance to pay attention to lately on TV and especially not on the radio (no matter how good a job Uecker does at calling the games). This is something that I have to comment on. 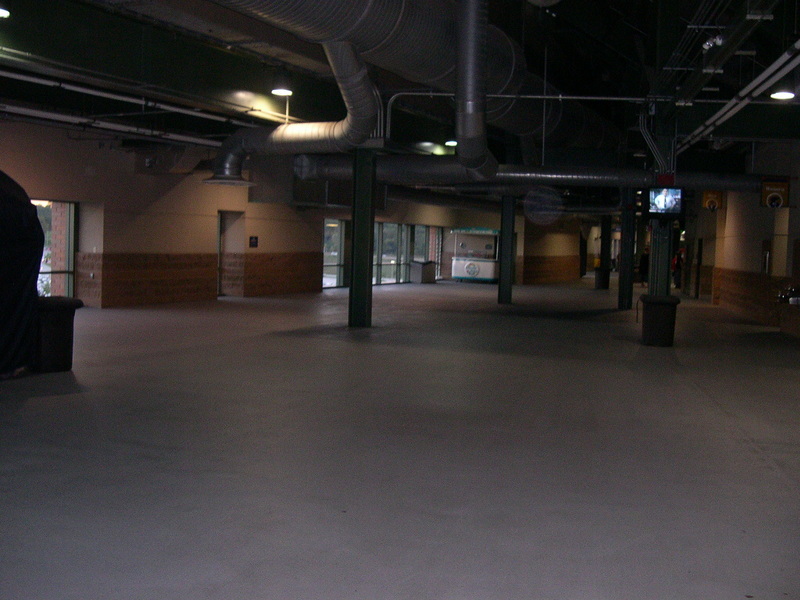 This was the view of the 400 level (Terrace Level) concourse 10 minutes prior to game time. Do you see anybody? I’ll give you a cookie if you do. This wasn’t in the corner, my friends…this was pretty much right behind home plate. The announced attendance for the game was 19,000+ (I have the exact figure in another picture, by the way which I’ll post later), but there was no way in he|| that there could have been that many people in attendance. We finally did make it through the massive crowd of people to our seats, and here was the view from my seat at the game last night. We were in section 424. There wasn’t a section of the stadium that we lost due to obstruction or anything else. 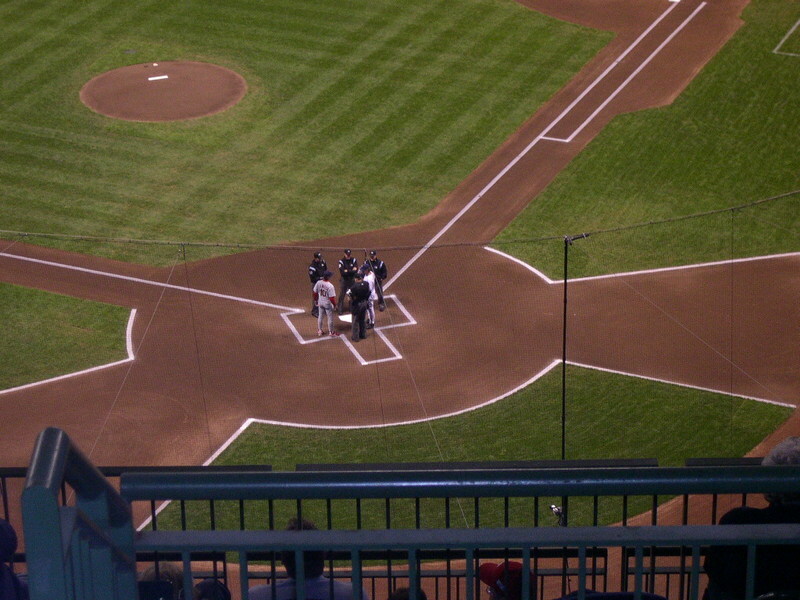 Yes, my picture doesn’t have the left field corner in it, but trust me…I could see the thing. This was in the middle of a Chris Capuano delivery to Cardinals’ back up catcher (and former Brewer) Gary Bennett during the top of the 2nd inning. The things I saw first-hand during this game included actual team speed! It’s something that we haven’t seen since Rickie Weeks went down, but now we’ve got three (3!!) guys that can run. 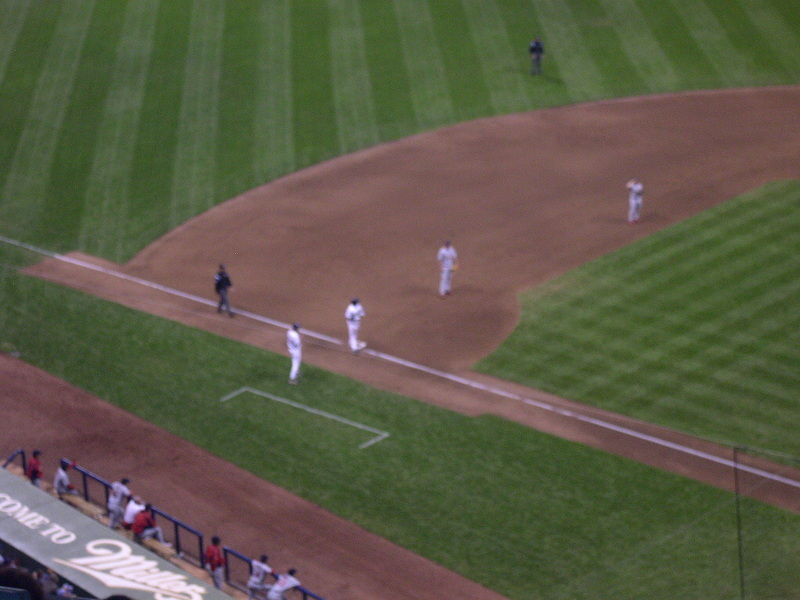 I saw Corey Hart and Tony Gwynn (yes, neither actually caught the ball this time) converge on a shot hit to the absolute middle of the gap between them and they both got there! It was absolutely nuts. It’s one of those shots that none of us expected anyone to get to, and I GUARANTEE that if that had been Kevin Mench in left and Brady Clark in center, or Gabe Gross in either field, or even the great Carlos Lee himself, that balls drops, rolls to the wall and possibly could’ve been a triple. It was straight up refreshing to see those kinds of wheels. 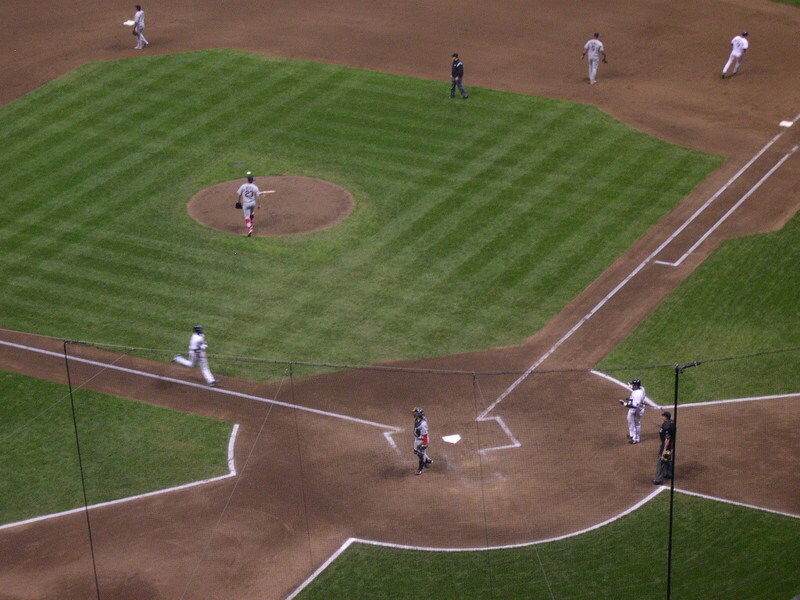 The first pic is Tony Gwynn standing on 3rd after the triple he hit. And the 2nd? 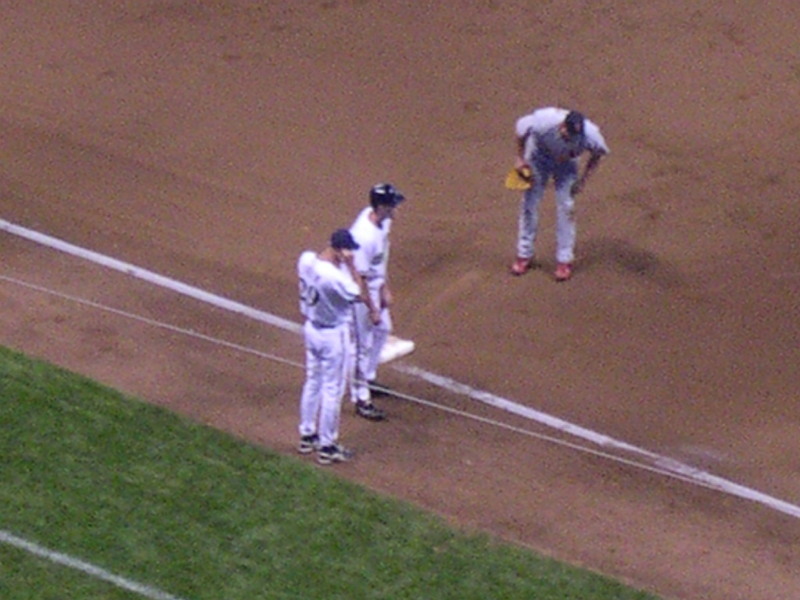 Corey Hart standing on third after his RBI triple. That kind of effort, baserunning and flat out burn-ability is something that has been sorely lacking. Remember who won the World Series last year? It was the Chicago White Sox. Remember how they did it? By playing station-to-station ball and having guys run all over the place once they got on base. They imported Jim Thome this past offseason, and along with Jermaine Dye and Paul Konerko, the ChiSox have been hitting many homeruns this year. Where do they currently sit in the standings? Not even leading the wild card, and in fact in third place in their own division. Yes, pitching had a LOT to do with their run last year, but it’s interesting to see the correllation between offensive style and win totals too. Can you imagine the kind of speed we are capable of having on the team next season? Weeks, Hart and Gwynn can all fly. In a situation where you have them all in the lineup, you won’t have to have guys like Bill Hall and Brady Clark trying to steal second when they’re even getting thrown out by Mike Piazza’s dead arm for example. You let your hitters hit, your runners run and you RBI guys BI R’s. Moving along…let’s talk a bit about the old guard of this team. First up, I’d like to discuss Geoff Jenkins. This is Jenkins after having crossed home plate on his home run trot. Jenkins’ average is up, his power is back, and he’s been playing clutch all month. I went to the game against the Marlins back on Robin Yount bobblehead night (September 2nd) and Jenkins was Mr. Clutch in that game too, hitting a two-out, two-run homerun to temporarily tie it up in the bottom of the ninth off of the Marlins’ closer. Jenkins has been lights out. This begs the following questions: Why can’t Geoff play like this all year? If he can, why doesn’t he? Can he not handle the pressure of a penant (or even wild card) race? Why does he thrive at the end of the dog days? Is it because the pitchers are finally getting tired so their pitches aren’t breaking like they did back in early summer months? Geoff Jenkins is the ultimate question mark heading into the offseason. Do we trade him now (meaning when the year is over) while he is showing that he really can hit this well? Or do we keep him as our everyday rightfielder when camp breaks and pray he doesn’t hit the wall as hard next year? I honestly believe that Geoff Jenkins is NOT a #3 or #4 hitter. Period. He struggled at the 3 hole and only responded when there wasn’t as much pressure on him because he had been dropped in the batting order. I can’t call him a poor man’s A-Rod because he’s just not that talented, but in the pressure-handling department, the label seems to have merit. Now that the Brewers are all but mathematically eliminated from the post season once again, Jenkins starts to hit. Finally, I want to discuss what I saw out of Bill Hall on Monday night. 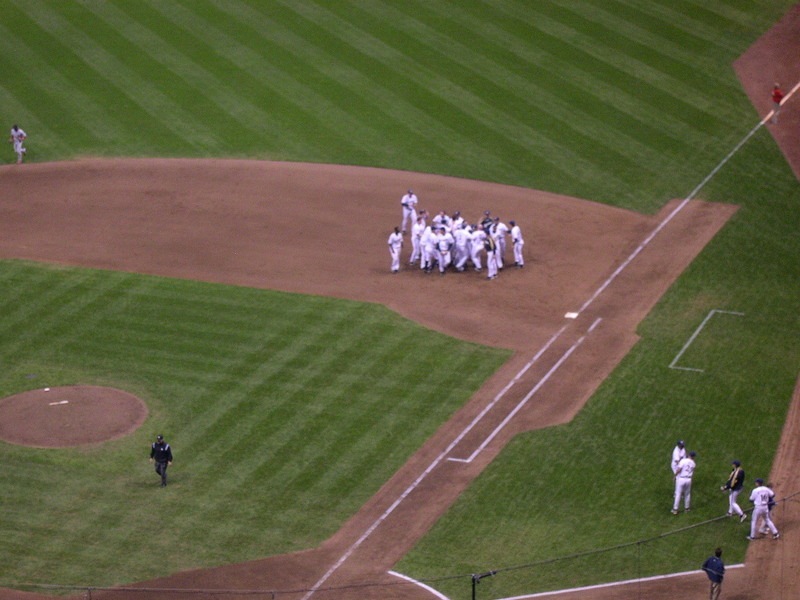 …is a picture of the aftermath of Hall’s 3rd at-bat of the ball game. As you can/will see, it is Bill Hall walking back to the dugout, bat in hand, just like he had done the previous two trips to the plate. That’s right, 3 strikeouts in the game. In Hall’s defense, he did pop out weakly in his fourth AB. I’m all for his 30+ homeruns. In fact, I love them. And I’m not naive enough to think that you can have all the homeruns and none of the strikeouts. But Billy, would it kill you to at least try to drive the ball the other way when a single or even a sacrifice fly would help out the team? The above pics are, in order, the lineup card exchanges between Tony "I had to beat the umpires to the plate because I’m too awesome for words" LaRussa and Robin Yount; Tony Gwynn scoring his first major league run on a sacrifice fly by Tony Graffanino after Gwynn tripled; the team mobbing Graffer after his game-winning walkoff single that scored Drew Anderson from 2nd in the bottom of the ninth. 1.) Should the Brewers hold onto Jenkins for next season? If so, should he start? If not, what would be okay in your opinion to get back in trade? 2.) If J.J. Hardy comes back 100% healthy and plays like he was playing before he got injured this year, what do you do as head coach with the Shortstop position? Please include information like: who starts? if there is a platoon, how much does each guy get? etc. We can’t lose 100 games this year. Hey, small victories are still victories. Ladies and gentlemen of the Brewer Nation, you’ve been had! Hoodwinked! Bamboozled! Run amok! We didn’t land on inconsistency…inconsistency landed on us! I know that it’s been a LONG time since I have posted to this weblog. For that, I shouldn’t be the one apologizing, but I will. Kind of a long story behind it all. Regardless, I attended last night’s Brewers/Marlins game and felt compelled to post again. It’s the first game that I’ve attended since late July (against the Reds…the one where Turnbow actually saved the game), and I’ve got to tell you that the Brewer faithful is beginning to get restless. They were quick to boo those that deserved it (Jose Capellan for example) but still showed love and support to anybody until they proved they deserved otherwise. While not nearly as loud as it used to be, the fans even still cheered when Turnbow came out to pitch. What I didn’t understand, however, were some of the moves that Yost made in this game. For instance, he brought in Francisco Cordero when the game was tied in the 8th inning….the 8TH!! I understand the desire to keep it tied if at all possible, but why not save him in case we get ahead in the bottom of the 8th, and/or to pitch the ninth to keep the Marlins in check at that point? And what I also don’t get is Yost’s managerial style the past few games. Bringing in your best bullpen pitcher early is one thing, but pulling a pitcher mid-AB because he went 2-0 on a guy? Makes sense if you’re trying to win ballgames, but we were 10 under (now 11). Where was this type of urgency out of Yost 50 games ago? 15 games ago? Even 8 games ago when we were 3 games under .500 at 62-65 and only 4.5 out of the wild card? Do you all realize that had we swept the Marlins in Florida that long weekend, that we would have been right at the top of the wild card standings by the end of that series? The Reds got swept by San Francisco that same weekend. For too long, it has felt like Yost is only trying not to lose ballgames and hope something happens by accident that allows for the win. That kind of attitude isn’t going to accomplish what should be his goal of reaching the post season. Anybody got thoughts on that one? Anybody else have ideas? I’ll post again toward the end of the season about this (when I have time to do proper research) about upcoming free agents and who I’d like to see the Brewers persue. Now that this stretch run has come to an end, it’s time to review where the Brewers ended up in my little measuring stick criteria that I laid out a couple of weeks back. 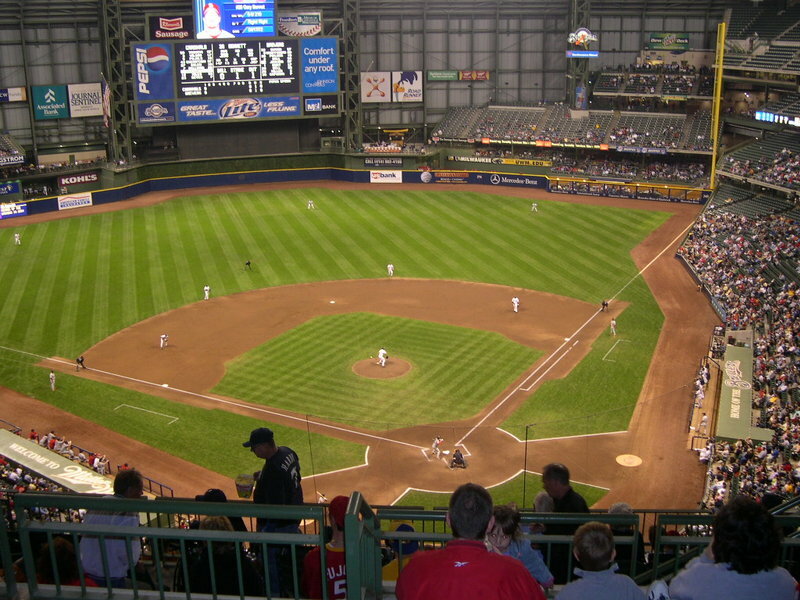 I had stated that for the Brewers to really make a move, they needed to win eight of their most recent 12 games. It’s a move that would’ve made the team two games under .500 with a record of 59-61. It would’ve been a statement! It would’ve shown the Reds, the Cardinals and anybody else in the NL that the Brewers mean business. It would’ve told the world that the Crew was ready to make a move. Instead? We finished that stretch run 6-6, we’re still six game under .500 at 57-63, and now sit 5.0 GB of the Cincinnati Reds. The Reds record over that same time period? 7-5. Had we gone 8-4, we gain ground instead of losing ground. There are 42 games left for both the Brewers and the Reds. That’s an average of 14 3-game series (obviously, they aren’t all 3 game series, but I’m talking straight #’s here only). If we were to average a series win (impossible for this club) for the rest of the year, we amass a stretch run of 28-14, and finish 85-77. Over that same stretch, the Reds would need to accrue 22 wins or less, meaning that the best they can do is 22-20 (with our going unconscious) for us to win the wild card…assuming that nobody else in the national league does better. And therein lies the problem even when facing a deficit of "only" 5 games in the Wild Card standings…not only do you have to play better than you’ve played up until that point (because honestly, had you been playing well enough, you wouldn’t be behind to begin with), but the teams in front of you also have to play poorly enough for you to be able to pass them up. The Brewers "Elimination #" in the division is down to 37. An Elimination # is the combined number of wins by the team leading a division and losses by the team with the number that are needed to eliminate the lower team from winning the division. Our Elimination # for the Wild Card is 38. For what it’s worth, nobody has technically been eliminated yet. Not even the Kansas City Royals from winning the AL Central instead of the best team in baseball (by record), the Detroit Tigers. The Royals still have an impossible number of 7. And that’s combined. That means, for them to not get eliminated, they’d have to go undefeated while Detroit finished the year 6-36. You think that’s a bit unlikely to happen? Me too. At worst, the Royals could finish 35-6…if the Tigers didn’t win another game. But then again, by that point, somebody else would have overtaken the Tigers in the Central, and the Elimination # becomes based on somebody else. It can be a bit confusing to say the least. The point is, the Brewers aren’t out of it by the numbers, but overcoming being 5 games back isn’t as simple as it sounds. There are a lot of factors that have to align. I know that you are all going to say "No!!! Adam, what in the he11 are you doing????? Not a series preview!" In my defense, I realized that the only series that I had done full previews for were on the road. And what do the Brewers do a lot more often on the road than they do at home? That’s right kids, LOSE! Oh nevermind….the next line would have to be about becoming champions of something. While I am the eternal optimist, my timeline (as stated a few times prior) doesn’t haven’t us winning anything until next year at the earliest, and I still think it’d be a lot of luck if we were to win the Wild Card next year. That’s not to say that we are incapable of sweeping the Astros right out of Miller Park. That would put us at 61-63, and a whole helluva lot closer to those pesky Reds (assuming that don’t also go 4/4 over the weekend). Jason Hirsh made his Major League debut in his only appearance of the season just 5 days ago against the San Diego Padres. Hirsh took the loss in that start, only going 4.0 innings while giving up four earned runs on seven hits (three of which were home runs). He also walked two and struck out four. He threw 87 pitches in that game, only 54 of which found the strike zone. Hirsh could be good for what ails the Milwaukee Brewers at times lately…scoring runs. Not only does he have quite the propensity for giving up gopher balls in the EXTREMELY small sample size of data we have on his Major League career, but we should have all of our guns in the lineup considering that Hirsh is a righty. There will be no day off for Prince Fielder tonight, and hopefully no off day either. That’s not to say that Hirsh doesn’t have the best of the best to learn from. Roger Clemens and Roy Oswalt (whom the Brewers face in Games 4 & 3 of this series respectively) are pretty good right-handed pitchers. They have no doubt gone over the problems Hirsh had in his first start. We could see a sharp performance from the prospect. Afterall, he was 13-2 this year in AAA with 118 K in 137.1 IP and an ERA of 2.10. Opposing hitters only had a .193 average with an insignificant 5 home runs all year. Really, this one could go either way. I’m hoping for a little nervousness still and that maybe a little bit of doubt has crept into the back of his mind. An early couple of runs, or better yet a dinger or two could be just what the doctor ordered. Let’s "Zambrano" this kid back to Round Rock. The last thing we need is for the offensively challenged Astros to get going right out of the gates and give the kid his confidence back. But that’s where Ben Sheets comes in. Not only do the Astros tend to have bigger problems scoring runs than the Brewers do most times, but our ace is on the hill and looking to build on a strong-enough outing against the Atlanta Braves also from August 12th. When Sheets is on, he’s one of the best in baseball. After a lengthy stint on the disabled list, Sheets came back with a venegeance on July 25th against the Pittsburgh Pirates. He threw 7.0 innings of 1 run baseball, scattering 6 hits and striking out 5. In his very next start, against the wild card leading Cincinnati Reds, Sheets picked up the win pitching 8 shut out innings before giving up a 2-run homer to Ken Griffery Jr in the top of the 9th. The bullpen locked it down for him after Yost didn’t want to further stress Sheets’ arm. His 101st pitch of that game was the home run. Sheets had a touch of stiffness in his chest after the first inning of his third start back against St. Louis. He was pulled after having thrown 27 pitches in the first inning. He was given a couple of extra days off before throwing against Atlanta in the game I mentioned first. Now, Sheets will be making only his 9th start of the year. He is looking to pull to an even 4-4 record while dominating a team that he, historically, has handled fairly well. His lifetime numbers against the Houston Astros include a W-L record of 9-7 including 3 complete games. He has struck out Houston batters 109 times, trailing only the Chicago Cubs on Sheets’ personal record book. He has walked a measly 22 hitters in 116.1 IP. His career WHIP is 1.15. All of those numbers do include Sheets’ one start against Houston this season; a start where Sheets reinjured himself and went on the DL for the 2nd time this season (he had started the year on the DL as well, if you recall). In that game, Sheets only lasted 2.1 IP, getting absolutely destroyed for 7 ER on 9 hits. Houston hitters touched him up for a .643 batting average that day versus a career number of only .248. Sheeter is primed for a rebound game. Obviously, none of our hitters have faced Hirsh in the Majors because, like I mentioned, his debut was just this past Saturday. I can tell you this, though. Left-handed hitters beat Hirsh up in his only other start. They hit .500 off of him with a .600 OBP. OPS is over 1.400!! Righties didn’t fare too poorly either, having hit two of the three home runs Hirsh allowed. But back to lefties for a minute. We do happen to have one of the hottest left-handed hitters in all of baseball right now…who just had a day off…who is rested…who hits the Astros (in 5 games this season) at a .438 clip with a 1.375 OPS of his own…who has 13 of his Brewer rookie record 22 home runs against right-handed pitchers. Yeah, that Prince Fielder guy. I hear he’s going to be pretty good. Game 1 has all signs pointing to a Brewer ‘W’. That usually spells disaster for Los Cerveceros, but I think that tonight will be different. Sheets should be solid, and even if the rookie Hirsh is razor sharp…..you still have to score at least one run to win. Houston, many times over, has proven that they can’t always handle that proposition this season…or last season…or the year before that. In fact, the Astros have been held to 2 runs or fewer 33 times this year with an incredulous 10 shutouts, including two in their last series against the Cubs. They were swept out of Houston, and have lost five games in a row. 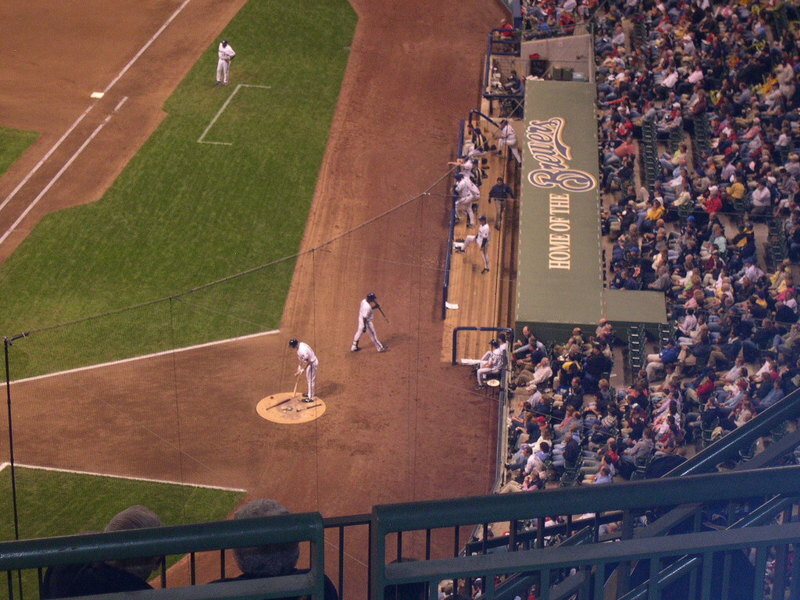 The Brewers need to score early, and just in case (as evidenced by Houston’s 6-8 loss to the Cubs two nights ago in 18 innings and by our own 13-12 loss to them early in the season) we need to score often as well. Jason Hirsh should give us every opportunity to get off to a good start. Let’s sweep the Astros out of Milwaukee, out of the Wild Card race and motivate them to hopefully sweept the Reds the three games after they’re done losing to us. We have another three game series with the Astros that closes out the month of August, and I’d like them to be looking up at us in the standings by a few games by that point. Ideal situation? We sweep them, they sweep the Reds, they get swept by the Pirates and we go into Houston facing a team that’s 10 games below .500 and wondering what went wrong so that we can sweep them again. Stupid? Naive? Fool-hearty? Well, I prefer optimistic, but whatever works for you. Look closely at this picture. What do you see? Do you see a starting pitcher that gave up 6 ER on 3 homeruns within 3 innings on a game yesterday? Do you see a pitcher who looks to be wiping a tear from his eye for how bad he was throwing? Do you see a pitcher who threw the game away for his teammates and wound up with a loss? I see all of those things…except all of them didn’t happen. That’s Giants starting pitcher Matt Morris. He did pitch poorly. He did give up 3 homeruns of varying RBI-production within three innings of work. He did pitch badly enough to cost his team the game and to take a loss…a loss that would’ve ended a 5-decision winning streak. But he didn’t wind up with that loss. Instead, he "settled down" and didn’t allow another baserunner until he hit Rickie Weeks with a pitch in what…the 7th inning?? It is ridiculous to believe that after just plain dominating Morris for a third of the game that he’d be able to fool us so badly from then on out. And don’t even get me started on Doug Davis and his I’ve-been-staked-to-a-six-to-one-lead-so-now-I-can-nibble-to-my-little-heart’s-content bull. Another three walks to go with eight hits. That’s an 11 in the numerator of our little WHIP calculation. In the demoninator is a 6.1 IP. That works out to a 1.74 WHIP. That’s not going to get the job done when you’re a soft-throwing left-hander that needs to be in control and hit the corners to succeed. I think our offense got complacent in yesterday’s game. They all probably figured: "He we go again, baby. Yesterday was a let down, but today we’ve already got six runs through two and a half. Let’s put this bi+ch on cruise control and get ready to leave for Cincinnati." News flash! There was still a game to play. I know everybody wants to have confidence in whoever is on the mound, but that doesn’t mean that you can stop trying…especially given what happened the night before. Hey, Brewers! THE GIANTS CAME BACK TO BEAT YOU YESTERDAY!! YOU DON’T WANT THAT HAPPENING AGAIN, DO YOU?!? Speaking of yesterday, allow me to make my three comments on that game. A: Geremi Gonzalez needs to officially be our "long man for when the game’s already been lost". No more running him into games where you have a chance to win. There’s a reason the Mets let him go. He wasn’t helping them win. It’s time that he stops trying to help us win too. We’ve seen the results of those efforts. 2: This hits both yesterday’s game and Tuesday’s game….Bill Hall needs a stint on the DL. I know we can’t afford that right now, but he needs to rehab his injury. What’s that you say, Hall isn’t injured? How else can you possible explain his base-"running" mistakes? I figured he’s got cataracts or a scratched retina or maybe a blood clot on the brain that’s swelling and causing lapses in motorskills and intelligence. If he’s healthy, maybe a good swift kick in the @$$ would help. The guy’s got SO much talent, and for whatever reason he’s just not doing enough with it. I love the 19 HRs, but I hate the 95 Ks. His strikeout percentage is a successful batting average!!!!!! It can’t continue. 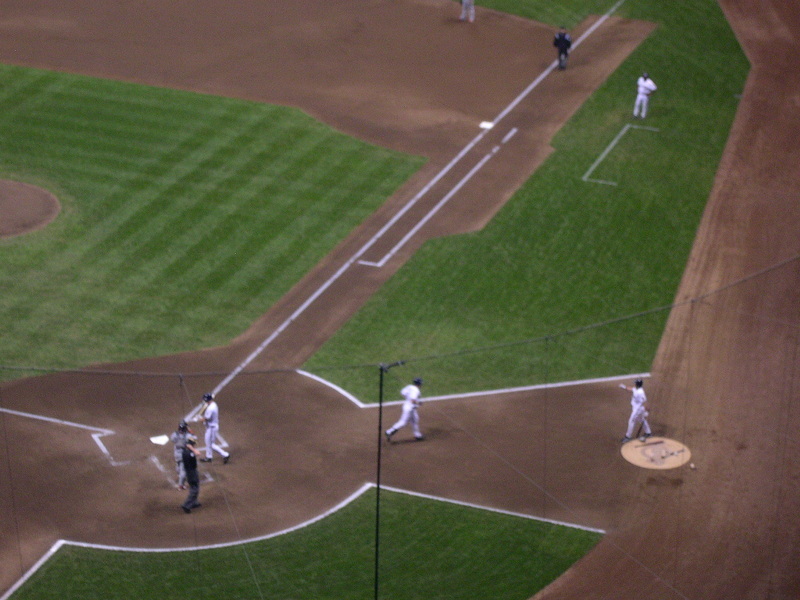 We don’t have any other options, but that doesn’t mean that Yount or Yost or Sveum can’t remind him that the opposite field is his friend, and that it’s okay if you get a single with the bases loaded and drive in two instead of wanting the grand slam but grounding out to third base. D: My hitter for Game 2…Cirillo again…1/4, 1 K. Nothing to write home about. He didn’t produce, we lost. I’d like to think that I had the right guy that we needed to produce, and since he didn’t, we didn’t score more and ultimately lost. Anyway, back to Game 3 and the series as a whole. I haven’t yet watched the ninth inning of yesterday’s game because it wasn’t on TV here (I’ll have to check it out on MLB.TV later today), but I hear that Turnbow’s latest blown save (that makes 4 in a row) was due to bad luck rather than bad pitching. It sounds like that’s the case with a 1-out single off of his glove that allowed two runs to score. For what it’s worth, in his non-save situation outing in Arizona on Sunday, he looked like the D-Bow of old. Hopefully that carries through to his next chance. Come on, no matter how frustrated you may be, you know he’s going to get another chance. Here’s a question for everyone to comment on…who else curerntly on the roster (I don’t want to hear about going to get Bob Wickmann, but feel free to use our farm system if you know a name) would you have close? I know we did the opposite of what I suggested might happen in Monday’s game by tattooing Jason Schmidt. The problem was, we still had the hangover that I predicted could happen in Tuesday’s game, just for the other reason. We had the "we beat Jason Schmidt so we can take it easy today because Jamey Wright out performs my Hoover XL" hangover. Lot of good that did us. I mention that while San Francisco hadn’t scored more that four runs on us this season (our two games in May were a 0-2 loss and a 7-4 win), it was no reason to think that our six run outburst would stand up. That takes be back to the title of this blog post. Why do we ever take our foot off the throttle? We should know enough about come-from-behind victories to realize that it can happen to us too. Always keep going and always keep trying to score runs. I don’t care if it’s the top of the 9th and we’re up by 10. If you can add another run, you do it. The New York Mets recently dropped an 11-spot on the Cubs in the 6th inning of their game on July 16th. The Rockies/Diamondbacks game from just before the break on July 8th saw 13 runs scored between the two teams in just the 9th inning. The Rangers were up on the Yankees by a score of 9-0 in their game on May 16th and then still by 10-1. They lost 13-14…in regulation. Maybe they remembered that game when they kept pouring it on the Baltimore Orioles on July 13th. This is baseball. This kind of thing happens. But that’s just my point. Everybody knows it happens, so why would you think it couldn’t happen to you any day, any time, any game, any opponent. As Rob said in the previous post, or maybe in a comment to the post before that, this team has the offense to contend. They just need to utilize that offense, that talent, that ability. And for the love of all things holy, PLEASE don’t stop hitting when you start hitting. Just let it carry the team all the way through a game. Find a cinder block, put it on the accelerator, and just steer.